Photo courtesy of @cast_ph on Instagram. Often, staged readings are done to test out materials that are works in progress, but C.A.S.T. 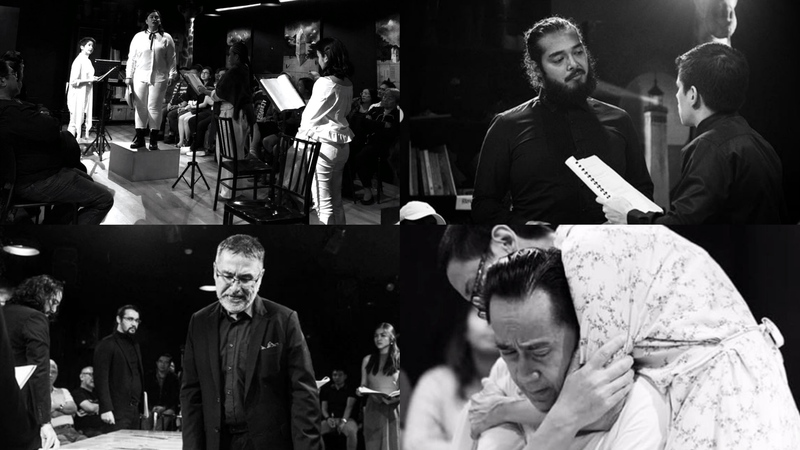 (Company of Actors in Streamlined Theater)–composed by Mako Alonso, Reb Atadero, Maronne Cruz, Sarah Facuri, Wanggo Gallaga, Nelsito Gomez, and Jill Peña–repurposes this as its own form of audience-ready theater. They stage known foreign work by known foreign playwrights, strip it down to performers and piece, and hope that their message and meaning shine through. While each show made for engaging Sundays at Pineapple Lab, what were highlighted, above and beyond the material, were performances. James Christy’s “A Great War” is about the realities of war. Directors Sarah Facuri and Nelsito Gomez configured their actors as sitting in front of each other, as though chess pieces awaiting their next move. It’s an apt allegory to war, and James Christy’s “A Great War” may be the most literal application of their season’s theme. In Christy’s play, we see the human cost of strategies in battle, the real-world effects of generals and leaders planning and scheming without much regard for people in the front lines. The complexity of the piece called for more than actors simply moving center stage to deliver their lines. Christy’s piece was rife with history that would have been better served shown through a proper staging. As a reading, it felt overlong and inaccessible, with actors bearing the heavy brunt of clear storytelling to varying degrees of success. Tarek El Tayech was the ensemble’s solely commanding presence as an officer in the war, while playing the central role, Luis Marcelo’s performance left much to be desired. Arthur Miller’s “All My Sons” is about the other devastations of war. The inclusion of Miller’s All My Sons in CAST’s season exploring war shows the unintended consequences of the simple fact that war exists. 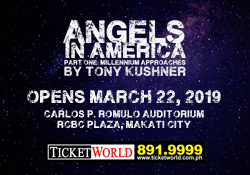 A grieving mother (Tami Monsod) clings to hope that her son is still alive after disappearing during WWII, while her husband (Audie Gemora) and son (Mako Alonso) are keen to move on. This family drama has multiple layers of tragedy to it, including the incarceration of the patriarch’s business partner after selling damaged machine parts that led to the unintended death of 21 pilots. Miller’s play focuses more on family dynamics such as the daily effects of a family’s reputation in a small town, and the return of a young woman (Mikkie Bradshaw) once to marry the disappeared soldier, now set to marry his brother. The performances were exemplary, such as Tami Monsod’s contained and fierce grief as the matriarch. George Schulze’s turn as a son to a wrongfully imprisoned man was a welcomed addition well into the second act, creating a completely actualized character that was fascinating to watch. Audie Gemora and Mako Alonso created a compelling dynamic as father and son, culminating into an explosive and even physical end to a second act that left audiences stunned. Directors Wanggo Gallaga and Nelsito Gomez expands the staged reading into a more traditional configuration of their space as well as using props, enters and exits, and even costumes and make-up. While this certainly aided storytelling (especially for the explosive, physical second act), the staging looked more like a budget midpoint between a staged reading and a full production. James Goldman’s “The Lion in Winter” is a war between family. James Goldman’s exquisitely-written The Lion in Winter recalls to mind what makes Game of Thrones and its ilk so popular. Watching the petty squabbling of families over kingdoms and even their very lives is so far removed from reality, it’s easy to take it as form of entertainment. While rooted in history, the characters behave so very poorly that it beggared belief: King Henry II is priming one of his sons, John, to inherit the kingdom while Queen Eleanor wishes for another son, Richard, to take up the throne– all willing to achieve their goals at whatever cost. Directors Mako Alonso and Jill Peña moves a bit beyond staged readings here, too, mounting a large table in the middle as a singular set piece for the actors to move about around. It helps the imagery of family, that despite the large scale and implications of their scheming, each ill done is deeply personal as husband against wife, parents against children, and brothers against brothers. Tarek El Tayech again shows a commanding, magnetic machismo as Richard (even with implied subtext between him and Nelsito Gomez’ King Philip). Franco Ramos as the petulant young John and Justine Peña as the queen’s ward (and the king’s sultry young mistress) were both riveting, holding their own against stalwarts like Roselyn Perez and Jaime Del Mundo. What made this reading uniquely absorbing were Del Mundo and Perez, playing warring spouses who loved and loathed each other in equal measures. Del Mundo, especially, had an air of domineering majesty about him as the king. The entire cast delivers a show so good, you almost lament it was a one-day only affair. Lauren Gunderson’s “The Revolutionists” is a war against history. The company’s first show this season was also its strongest, featuring 4 phenomenal performances from its small ensemble of women playing notable female figures of the French Revolution. With minimal stage movement, and a choice of work that lends itself incredibly well to the staged reading format, this first offering (also directed by Jill Peña, with Maronne Cruz), was a showcase of just how far the form can go in delivering a full, high-impact experience without the aid of a full production. Lauren Gunderson’s The Revolutionists explores the role of women during the French Revolution, with assassin Charlotte Corday (Gabby Padilla), playwright Olympe de Gouges (Sarah Facuri), Marie Antoinette (Jenny Jamora), and Carribean woman Marianne Angelle (Bituin Escalante), and how history will see them in the aftermath. Gunderson’s acerbic wit and feminism is at full force pared down in this way with actors that didn’t just create indelible characters, but played off each other splendidly. Jamora was mesmeric as Marie Antoinette, playing her a little witless though with moments of endearing perceptivity. Padilla was delightful to watch as the tough Charlotte Corday, but it was Bituin Escalante’s performance as Marianne that elevated the art of the staged reading. She displayed raw, unbridled emotion so potent, that it literally rendered half the room to open sobs. It may be one of the year’s first performances, but though it’s only February, it just might be the year’s best.